The dashboard is where you'll land as soon as you log in to your SKULabs account. This acts as a central command center for all of your seller activities - it gives you information at a glance about your day-to-day operations, including order fulfillment stats, low inventory alerts, and per-user performance. When you first create your SKULabs account, the standard dashboard will be replaced with a simple setup guide. This is intended to show you the first steps you'll want to take to get started with SKULabs. 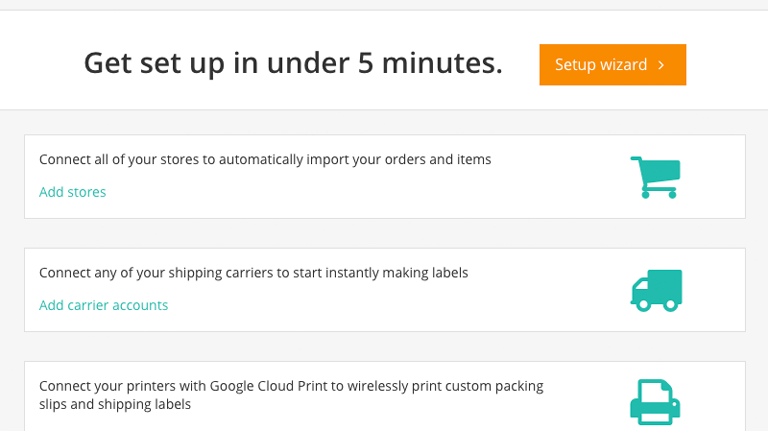 As you complete each step, such as connecting your sales channels and shipping carriers, those steps will be marked as complete. Once the majority of the steps are completed, you'll be moved forward to the standard account dashboard. If you'd prefer to skip the setup guide, you can select Continue to dashboard. Orders: This counts the total number of orders that have been shipped by all users within the specified time range. Items: This counts the total number of items that have been shipped by all users within the specified time range. Orders/hr: This is the average rate of order fulfillment by all users within the specified time range. Items/hr: This is the average rate of item fulfillment by all users within the specified time range. Accuracy: This is the average accuracy of scans by all users within the specified time range. 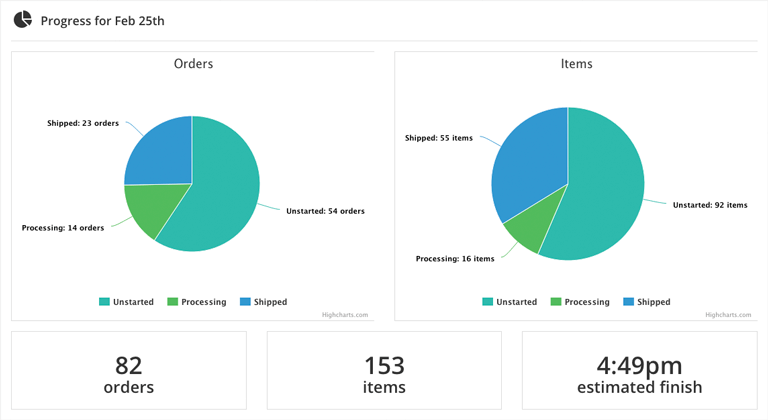 This portion of the dashboard shows your stores' current order fulfillment progress. It breaks down all of your open orders and items by their fulfillment statuses, such as Unstarted, Processing, and Shipped. Beneath the charts, you'll see a tally of all of your open orders and items, as well as an estimated finish time. The estimated time is calculated based on your users' average fulfillment speed so far today. This portion of the dashboard will show any items with an inventory count below their alert threshold. The alert level can be created or modified by going to the Item page and editing the location in the Inventory section. 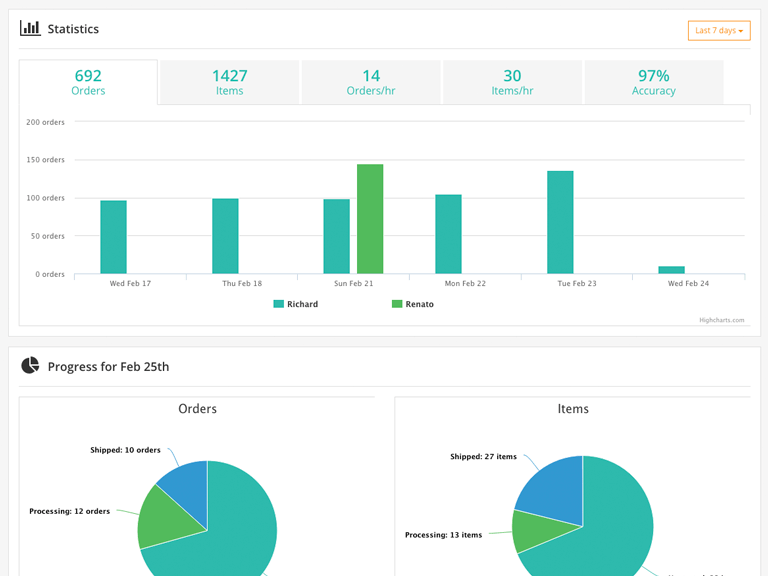 This portion of the dashboard will show any orders that have been in processing but have not been fulfilled in over two business days. To see order details or to begin fulfilling an order, select the Order # to go to the Order page. Tip: While every ecommerce business will have a different average turnaround time, order fulfillment within two business days is considered a healthy benchmark. Try to keep your aging orders list as short as possible by sending partial shipments, employing a backorder system, or offering substitute products to customers. This portion of the dashboard shows some overall shipment data for the selected time range. From here, you can see the number of packages sent and their postage costs broken down per sales channel, as well as the percentage of postage in relation to the sales earned in that channel's shipments. This portion of the dashboard will show which items you've cycle counted in the past, and how long it's been since the last cycle count for that item was completed. Selecting an item's name will take you to that item's details page, where you can see its past cycle counts and create a new cycle count if desired. This portion of the dashboard will show fulfillment and sales performance for your top catalog items and users for the selected time range. To see additional performance insights for a user, select the user's name to go to their user profile page.